Under the Windows XP platform there seems to be an interest in this area and I thought I'd share some really basic things I do when I re-skin. It's mostly copy and paste with a little touch up to make things look a little better. This usually involves a little pixel by pixel editing. 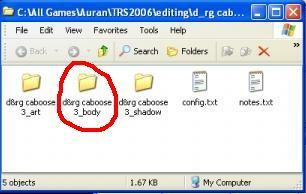 I understand that some of the problems folks are having are in accessing certain files like .tga. And, that's where Irfanview comes into play. Rule 1. I am NOT going to teach you how to operate Windows XP and all of it's functions. That you must learn elsewhere. Rule 2. I am NOT going to teach you how to operate MSPaint and all of it's functions. That you must learn elsewhere. Rule 3. I am NOT going to teach you how to operate Irfanview and all of it's functions. That you must learn elsewhere. Rule 4. I am NOT going to teach you how to operate Trainz and all of it's functions. That you must learn elsewhere. That said, I will share with you the steps I use in each of the above mentioned programs for re-skinning your favorite model. I will also try to share pictures when ever I can for simplicity's sake. Someone once said that a picture is worth a 1,000 words. OK, here we go. 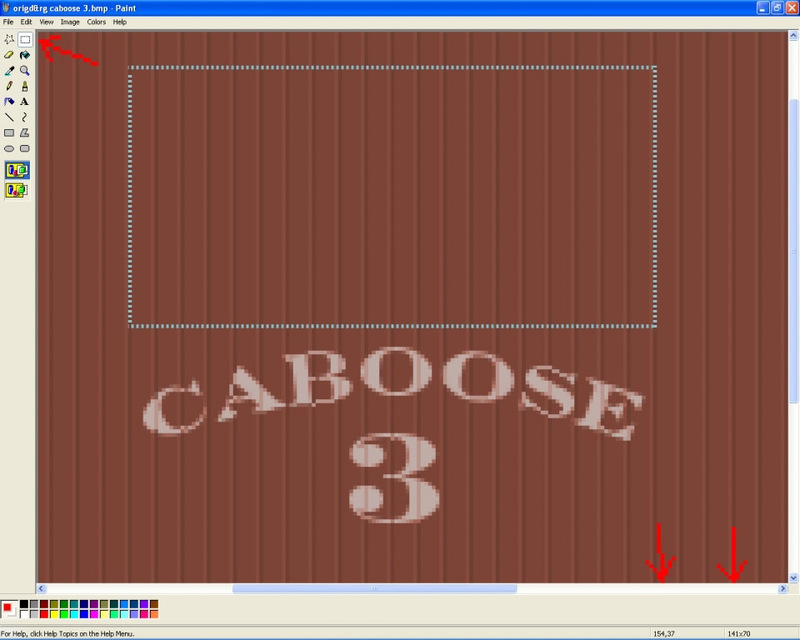 Let's re-skin a section of Elvenor's little 3 foot narrow gauge caboose. It must be installed before we can manipulate the files, though. Once you have it installed, come back to this point and we can proceed. We're now going to open the file I have circled in red with Irfanview, however, before we do, I want you to rename it and make a copy of it, in that order. It's a safety measure in case we really screw things up while skinning. 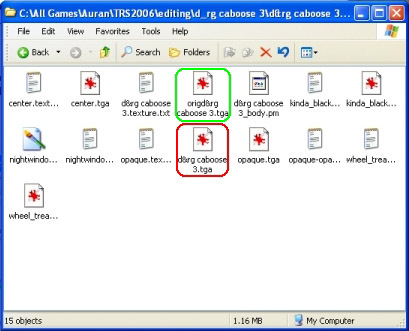 To rename it, RMC on the file in red, scroll to RENAME and write origd&rgcaboose 3.tga, or some such thing, then hit your ENTER key to save the new name. To make a copy, HRMC and drag the file to a clean space in that window and then release. A little menu will pop-up. Select Copy. This is a texture mapping file. 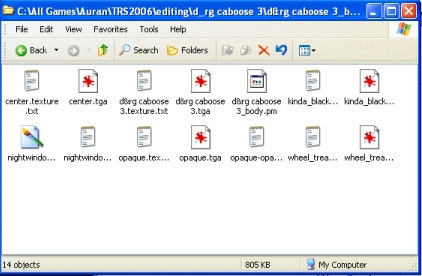 This is the file where the author has placed all of the textures for the various parts of the model. Some of it is obvious but some of it is confusing and unknown. This is where trial and error come into play upon finding parts of the model to re-skin. Meanwhile, let's re-save it into another format so we can RE-SKIN it. Yeah! Before we start re-skinning, I would like to make something perfectly clear about this part of the hobby. This is precise work and will need to be done pixel by pixel. There is very little room for mistakes so, please pay attention to what I'm going to share with you. 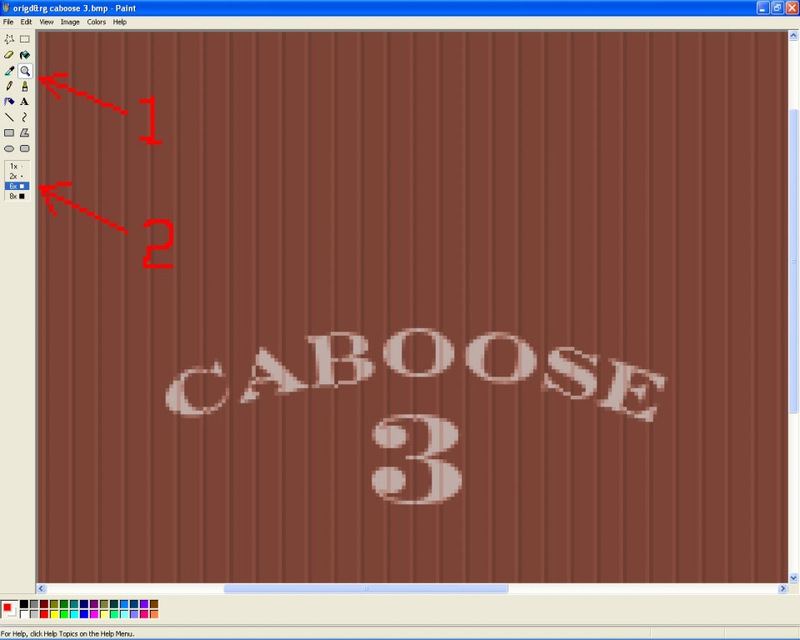 Because this is only a bare bones tutorial on re-skinning, I'm now going to show you how to remove/re-skin the CABOOSE 3 lettering. We will now have to 'blow it up' so we can be accurate in doing so. LMC on that little square box thingy then, in an area just above the words Caboose 3, HLMC and drag a box towards the bottom right, but not going into the letters of the Caboose, then let go. All we’re doing here is making a box the same size as the area of the writing. Those two vertical arrows in the lower right hand corner are pointing to your pointer coordinates and will be used for more precise work. Just a note for later tutorials. They will help a bit later when you need them. RMC anywhere and choose PASTE. Bingo! That squared object that just appeared is your new piece of 'siding'/skin you're going to slide into place. Move your mouse pointer to within the square box and HLMC to drag it around, carefully aligning the dark width lines we used as guides. When you have it aligned where you want it, LMC anywhere outside the square/box and, (!VOILA!) you're done. Oops, did you mess it up? 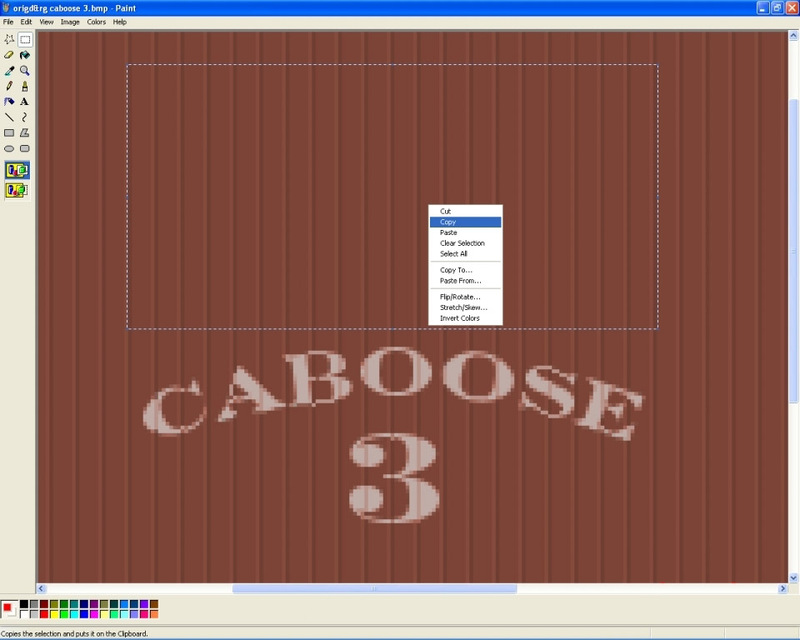 Don't panic, MSPaint has three undos you can use. LMC Edit, click Undo , then click Paste again. Let's wrap this thing up so we can admire our handy work. That's it! You may now close all your folders/windows and launch the game to admire your newly skinned model. Now, let's really sum this thing up into steps. And, that my friends, is the absolute, bare bones of re-skinning. If you'd like to download this tutorial in Acrobat format, click HERE (1MB)!